“Video editing” is a broad term. Video editing software helps creators with complex tasks like pixel adjustment and simple tasks like making a meme. We think that one of the basic functions of a video editor is the ability to combine and arrange clips, scenes, and media into a movie. Yet today’s users have to choose between confusing, overly-powerful desktop editors and mobile apps that make it hard to multitask and import videos from YouTube. Two weeks ago, Eric and I launched the Montage Maker, a tool that makes it way easier to make movies online, on Kapwing. You can merge videos, combine clips, append intros to a longer video, and much more. In this article, I’ll describe how you make some popular movie formats with Kapwing’s new Montage Maker tool. 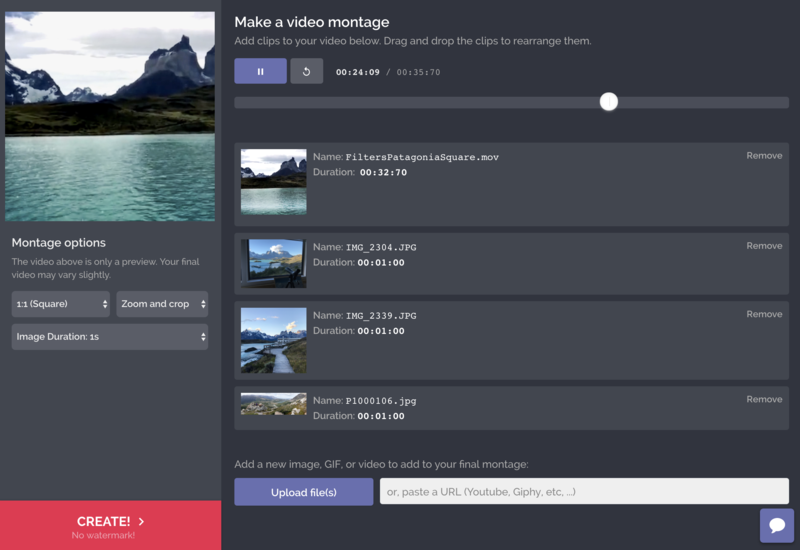 The Montage Maker is Kapwing’s solution for combining video clips, images, and GIFs into a single continuous movie. It’s the simplest, most straightforward way to make a compilation, slideshow, montage, stop motion, or multi-scene video. No frills, software downloads, technical tutorials, silly transitions, or advanced export options. Just a tool that combines your media into a video, instantly, for free. Step 1: Set up your camera on a stable position or tripod and create the first scene in view. Take photos as you make gradual adjustments to recreate the action you want. Step 3: Upload all of the photos that will make up your stop motion movie. Using the video preview as your guide, drag and drop to put the photos into the right order and add/remove photos to smooth out the action. Step 4: Choose how long you want each frame to last. Most stop motion videos show each frame for .5 seconds or less to given the effect of animation. Step 5: Once the preview looks right, click Create to process your stop motion video. Download, share and publish the video! Step 1: Gather all of the videos and photos you want to add to your movie. You can either have the media saved on your device or you can have a link to Google Drive, Dropbox, YouTube, Vimeo, or any other video website url. Step 3: Upload the video clips you want to merge. Then, rearrange the video clips so that they appear in the right order. Step 4: Choose your size options. You can choose 1:1 or 16:9 to automatically size your output video for YouTube or Instagram. All of your media will be either cropped or fit with padding to the correct aspect ratio. Step 5: Create your video to download, share and publish! Step 1: Gather the links to the YouTube videos you want to use. If you only want to use subsection of the video, use the video trimmer first to cut out the parts you want. You can also embed captions or titles into the scenes using the subtitle maker. Step 3: Paste a link to the YouTube videos or upload the editing clips. Then, rearrange the video clips so that they appear in the right order. Step 4: Choose your size options. You can automatically size for YouTube or Instagram. Step 2: Upload the image you want to the Montage editor. Step 3: Make your video the correct length for your audio track. The montage maker has a maximum image length of 5 seconds, but you can repeatedly upload the same image to extend and customize the length. You can also add an intro or outro to the montage. Step 5: Click create to process the video. Step 6: Download your mp4 video. Kapwing doesn’t yet have a tool to add audio to a video, but we’re working on it! In the meantime, you can use another website to add your audio track on top of the converted video. 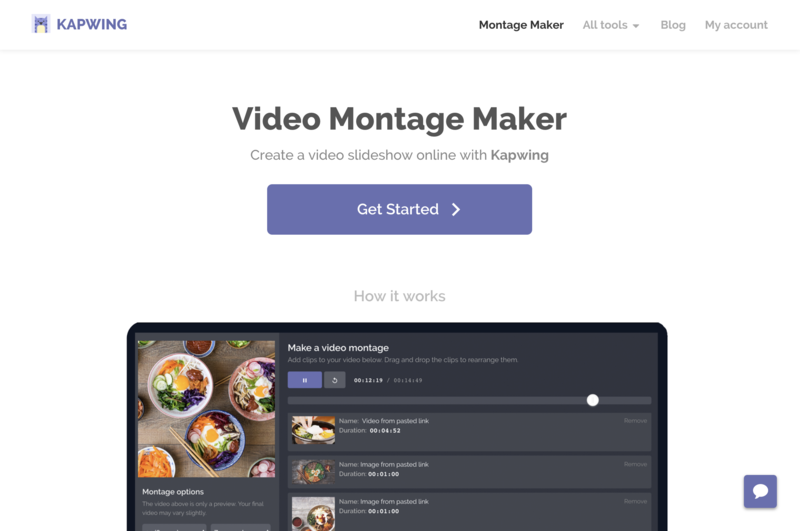 The launch of the Montage Maker brings Kapwing closer to offering a full-featured replacement for desktop editors like iMovie and Windows Movie Maker. Like all Kapwing tools, the Montage Maker is free and online, so it can be accessed on any device. It’s designed for speed and simplicity, so you don’t need any video editing experience to use it. Just open it up and click go. As always, Eric and I would love to hear your ideas, thoughts, and feedback on what works for you and what doesn’t. Subscribe to the Kapwing blog to get more updates on our journey to growing the web’s leading video editor!